Can you guess what I forgot to do? 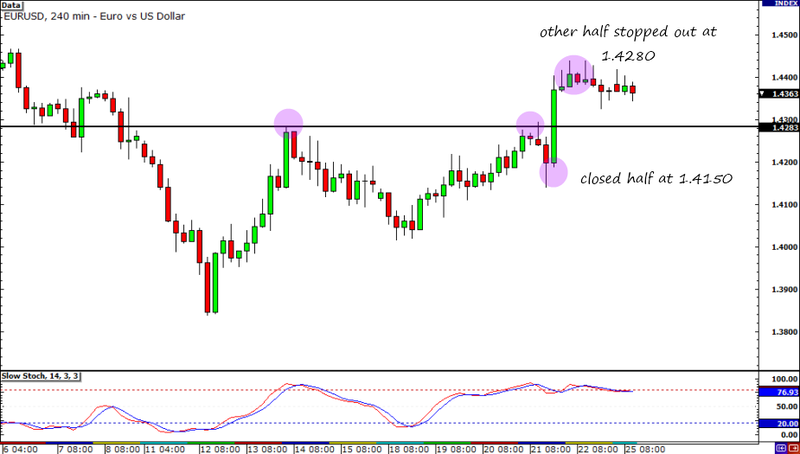 I forgot to move the stop on my remaining position to my entry point!!! Talk about being clumsy! As a result, the trade ended up being breakeven instead of a profitable one. Did I mess this one up. Oh well, lesson learned. Even if I am ahead, I should always remember to keep calm and manage the trade wisely. In other news, I plan on working on my HLHB system again.While the system isn’t really losing, it hasn’t been generating a lot of signals either. I need to tweak some of its filters to increase its profitability and to get more signals. I’ll update you at the end of the week so stay tuned! 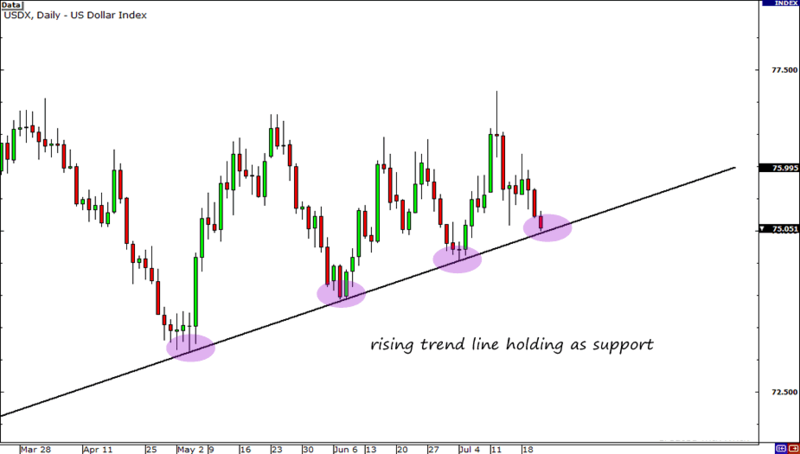 As you can see, the U.S. dollar index is once testing the rising trend line that extends all the way to April. Using this as basis, I have reason to believe that the U.S. dollar could end up rising versus other major currencies in the near future. Since one of the biggest components of the U.S. dollar index is the euro, I’m looking for a way to short EUR/USD. 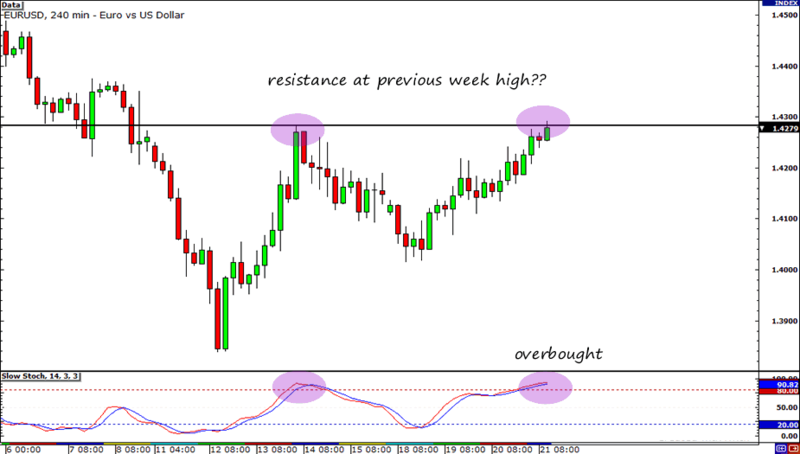 Looking at the 4-hour chart, I saw that Stochastic just hit overbought territory and is testing the previous week high. I’m not sure if the resistance will hold, but I believe this is a good time to short, especially since price is very near the 1.4300 major psychological level and not to mention that we’re gonna hear EU policymakers report on their plans for Greece. Earlier today I read a report which said that German Prime Minister Angela Merkel and French President Nicolas Sarkozy came to a compromise for Greece’s bailout. What exactly did they agree on? That’s a secret EU officials won’t tell… yet. If I remember correctly, Germany had urged that it should be mandatory for private investors to shoulder part of the bailout while France had argued that it should be voluntary. I’m thinking that if the terms regarding the extent to which investors would be involved in doesn’t impress the markets, we may see the euro get sold off. After all, credit rating agencies have warned that forcing investors to take losses would warrant a selective default for Greece. I know, I know. The U.S. has its own share of debt woes too. However, I heard that policymakers over at Washington seem to be willing to more compromise as President Obama said that they could increase the debt limit temporarily to avoid a default. In my opinion, there is still to much uncertainty surrounding the second Greek bailout. Perhaps the increased likelihood of the U.S. Congress coming up with a plan to avoid a default would make the dollar a better alternative to the euro. That being said, I shorted at market (1.4267) hoping to ride the pair’s potential move down (profit target yet to be determined). Of course, what’s a trade without a stop. I’ll consider my trade invalid if price moves 100 pips against me. Then again, that’s just my opinion. What do you think? Lemme know what your thoughts are through Twitter (@Loonieadventure) and Facebook, or by writing them in the comment box below. Wish me luck!